“Life finds a way,” is the famous line uttered by Jeff Goldblum’s character in the original Jurassic Park film. While the statement is true, it is also unfortunate when it applies to cancer cells. When a targeted therapy blocks a pathway that enables tumors to grow, the cancer cells usually manage to get around that obstacle, i.e., “life finds a way.” The ill-fated result of this scenario is drug resistance and the continued growth of the cancerous tumor. Now, researchers at the California Institute of Technology (Caltech) and University of California, San Diego believe they have found a way to map the alternate routes mutated cells use by studying individual cancer cells, suggesting approaches for developing more effective combination therapies. “Because technology now allows us to see the alternate pathways that cancer cells use to drive growth, it will enable us to identify ways to cut off multiple roads at the same time,” explained co-senior author James R. Heath, Ph.D., professor of chemistry at the NanoSystems Biology Cancer Center in the Division of Chemistry and Chemical Engineering at Caltech. In the study, the investigators looked primarily at glioblastoma, the most deadly form of brain cancer. Although tailored therapies based on genetic alterations in these tumors have been developed, their benefit is typically short-lived. Combination therapies, which target multiple alterations at the same time, may offer a better way to fight this disease. The research team used single-cell phosphoproteomics to peer into the inner workings of individual cancer cells and see their signaling. Using fresh patient tissues samples, the researchers found that the cells began to adapt to and resist therapies that target the growth pathway called mechanistic target of rapamycin (mTOR) in as little as 48 hours. Further analysis showed that these cells were remapping their routes and finding ways to evade the drug's effect long before any changes could be detected at the clinical level. 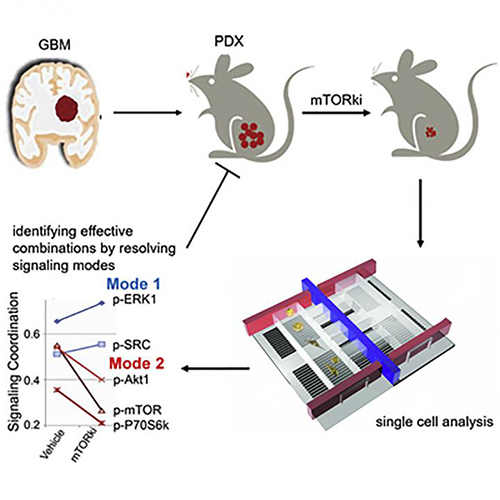 The research team believes that their approach could eventually be used to find better combination therapies for glioblastoma. However, the scientists acknowledge that some obstacles remain that need to be overcome before their method can see regular clinical use. Yet, the researchers are still optimistic as they also described that single-cell phosphoproteomics could be used to study how melanoma cells develop resistance to a class of drugs called BRAF inhibitors—opening the door to developing personalized treatments for many other types of cancer as well.